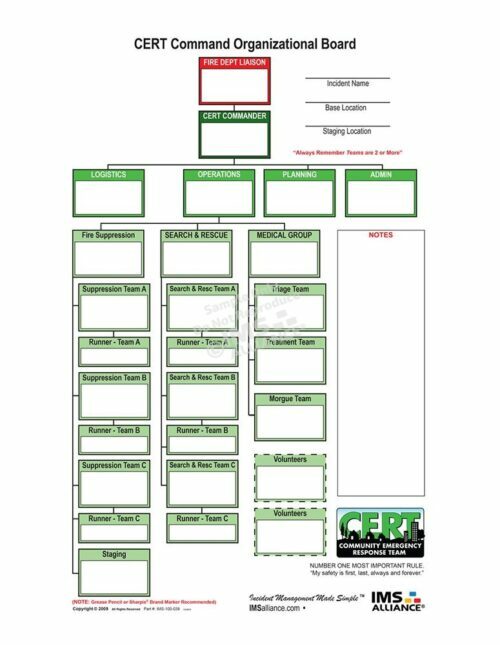 CERT Command Board for your Community Emergency Response Team (CERT) Programs. The CERT program can educate citizens in basic disaster response and emergency situation preparedness. Search and Rescue, fire safety, team organization and disaster medical operations are a few of the skills that volunteers learn in classroom and during exersizes. CERT Command Boards are an integral part of team organization and IMS Alliance provides the best with customizable options for your CERT needs.